As the Cabinet Office crisis management team, Cobra, meets to discuss the ongoing impact of the big freeze, key organisations tell the BBC what issues should be prioritised. The motoring organisation wants the government to ask famers with tractors to help clear the roads. President Edmund King said: "We all know salt supplies are low. Whenever snow is hard and packed, we should plough it. "Because there's a limit on the number of ploughs authorities have, we'd ask them to bring in more farmers with tractors... to act as snow ploughs to clear up the roads." He also said the government should consider mixing salt with grit or sand to make it go further, providing supplies to towns and villages so communities could "help themselves". "Salt is better because it thaws out the ice and snow, but sand helps you get a grip. 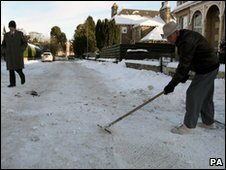 The main problems on residential streets is the lack of grit, with people skidding all over the place," he said. Mr King also said parking attendants and other contractors could be used to clear ice from footpaths, railway platforms and shopping centres. And he called for local authorities to be "totally upfront" about what roads have been cleared, perhaps providing maps with gritted areas in green and non-gritted areas in red. The trade association said the government should recognise salt was needed for warehouses, distribution centres, yards, the back of stores and car parks as well as on the roads. Spokesman Richard Dodd said there had been a "brief problem" with retailers getting the supplies they needed, but the government had acknowledged this and was addressing it. He said a lot of the "so-called crisis" has been "wildly exaggerated" and although people were shopping less because of the weather, they were buying more when they did get out. Mr Dodd added: "The weather is still only a relatively short-term problem, and it appears to be coming to an end this week... it won't have any lasting impact on food prices." The group, which represents farmers and food growers in England and Wales, said its members faced "difficult times". A spokeswoman said it had raised its concerns with Defra (the Department for Environment, Food and Rural Affairs), which would take these to the Cobra meeting. Acting director Martin Haworth told the BBC its members were doing all they could to get supplies through to consumers to avoid shortages and panic buying. But he said they had to contend with fields of frozen crops and farm tracks and rural roads that were difficult to access. "Many businesses are feeling the effects of the cold weather. Farming is no different but is more readily prepared and able to cope," he said. 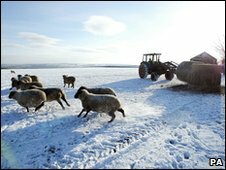 "Farmers are used to dealing with extreme weather conditions and are working very hard to make it 'business as usual' and helping neighbours by clearing tracks and gritting. "If the bad weather continues then the industry will pull together to ensure that deliveries carry on, and will do all it can to keep lanes and tracks clear so that goods can be collected." 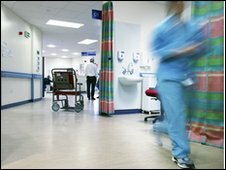 The body representing more than 95% of NHS organisations wants emphasis put on the careful use of all resources to cope with increased demand for services. Its director of policy, Nigel Edwards, said using online and phone advice through NHS Direct was often better and quicker than calling an ambulance. 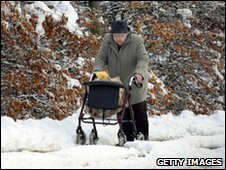 He said: "It is also vital to remember the NHS is a complex system which co-ordinates across different services in response to bad weather. "For example, delays in one part of the system, such as getting people admitted to hospital, can be exacerbated by an inability to adequately discharge patients already in hospital back home or to appropriate community settings." The UK's largest airports operator, which runs Heathrow, Stansted, Southampton, Edinburgh, Glasgow, and Aberdeen, said it had no pressing issues to highlight. A spokeswoman said: "Our airports broadly faired very well. Teams kept the airfields clear and runways open. "What's important for us is an early alert, but we had fairly reliable weather warnings in the first place and they came in in good time."